Sentinel Gel boxing gloves are injected with 4mm of Rev-Tech Gel™ over the main area of impact for maximum protection and shock absorption. Softech™ Leather gives the glove an already worn in feel: no need to treat or break-in the leather. Extra wide 3" wrist wrap is constructed with half elastic and half leather with Ultra-Lock™ hook and loop closure to create an extra secure closure. Rev-Tech Gel™ in the wrist wrap provides extra padding. Palm opening for increased ventilation and attached thumb for safety. 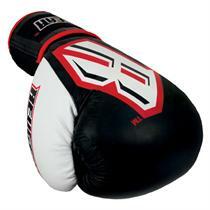 Email your friend about the Sentinel Gel Pro Boxing Gloves. Ask a question about the Sentinel Gel Pro Boxing Gloves.